Nothing beats a good massage after a long day. Although the quality of massage depends on the person administering it, the massage oil can also maximize your optimum massage experience. The best oil for massage should not only be relaxing but also beneficial for the skin. However, with the many brands of oil available on the market now, choosing the best can be a little daunting. To choose wisely, know the features that make a good massage oil which I’m going to share below. Keep reading if you like to know our honest reviews of five popular brands on the market today. Massaging the body with oil is essential to good health because it offers a lot of benefits. According to Banyan Botanicals, a massage oil can make your skin soft and reduce the signs of aging. It also helps strengthen your body while imparting firmness to the limbs. More importantly, it can help soothe your muscle pains and stress. If you like to learn how to massage your body, watch this video here. To choose the best oil for massage, check the ingredients. The massage oil should be free from any additives and must only contain natural ingredients. Most massage therapists prefer plant-based oils because they’re all natural and beneficial to the skin. Some good natural bases include coconut oil, jojoba oil, and sweet almond oil. You should watch out for animal-sourced ingredients, like lanolin because they’re greasy and sticky. Also, be aware of your allergies because there might be some natural ingredients that can trigger them. For example, sweet almond oil can trigger nut allergies. Viscosity indicates the thickness of the oil. Selecting the best viscosity boils down to personal preference. Personally, I like the right consistency of oil, not too thick nor too thin. Before buying, make sure that you test a little on your hands to make certain of its level of viscosity. Most people prefer oils with low viscosity because they provide more glide and less friction. As a result, the oil absorbs quickly into the skin. Unlike thicker oils, thinner oils move smoothly along the hand and don’t leave a greasy feeling. If you have sensitive skin, look for a massage oil that is labeled as hypoallergenic. This can help reduce the likelihood of allergic reactions to certain flower extracts and nuts. Typically, natural oils use hypoallergenic ingredients to be safe for all skin types, including sensitive skin. The scent of oil should not be overpowering to the senses. As possible, look for a good scent that can relax both the mind and body. Watch out for synthetic fragrances because they can cause irritation to sensitive skin and may deter the purity of the oil. To get the best massage experience, look for an oil that does more than relax your tired muscles. The oil should offer more benefits, like moisturize dry skin, condition the hair, and reduce cellulite. The more uses and benefits it offers, the better because it means you get the best value for your money. 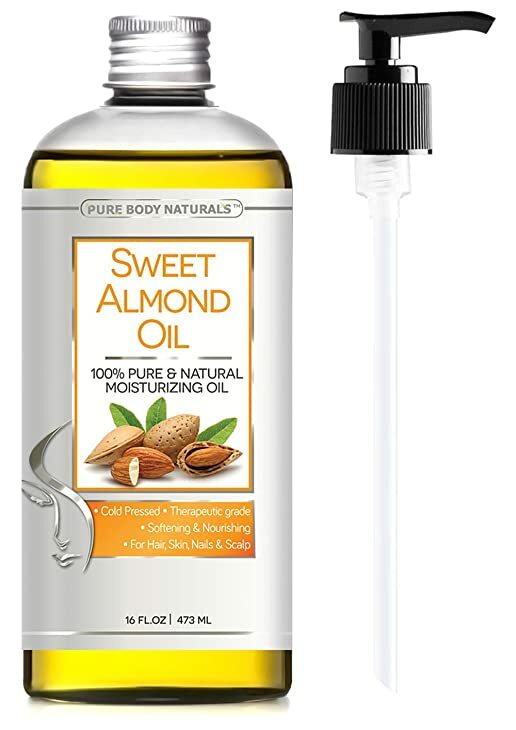 The Sweet Almond Oil by Pure Body Naturals is packed with analgesic properties to soothe muscle tension and pain. It’s a great massage oil as it leaves no grease behind and provides skin benefits. The Vitamins A, B, and E found in the almond oil can help delay the manifestations of aging by renewing cells for younger-looking skin. This oil is suitable for dry skin as it wonderfully moisturizes and hydrates the skin. You can use the oil in a lot of ways like remove makeup, treat skin diseases, and condition the hair. The sweet almond oil is 100% pure and cold pressed for better nutrient retention. If you like a massage oil that can help reduce cellulite in your body, then the Anti-Cellulite Massage Oil & Body Nutritive Serum by First Botany Cosmeceuticals could be the right one for you. It’s made of 100% pure plant extracts and free from chemicals. The D-limonene of lemon and grapefruit can help you lose the extra cellulite by massaging the problem areas to dissolve fat. This anti-cellulite massage oil is a blend of several natural ingredients: grape seed oil for astringent benefits, eucalyptus for relaxing effects, lemon for better circulation, and grapefruit for less visibility of cellulite. While removing unwanted cellulite, this oil can also help moisturize and hydrate your skin. First Botany Cosmeceuticals offer a refund of your money if you’re not satisfied with its quality. The Art Natura﻿﻿ls Fractionated Coconut Oil is made of 100% natural coconut oil without additives and synthetic perfume. It is ideal for rejuvenating damaged hair and moisturizing dry skin. Due to its high antiseptic properties, you can also use this oil to treat minor scrapes and cuts. The BPA-free bottle is designed with a pump to make the release of oil easy. This oil is perfect for acne-prone skin because it’s non-comedogenic. This means that it doesn’t block pores and cause breakouts. The Honeydew Therapeutic Massage Oil is a blend of sweet almond oil, jojoba oil, and apricot. All ingredients are 100% natural and free from synthetic preservatives and additives. It also includes several therapeutic oils from lavender and geranium for relaxation to ylang-ylang and sweet orange for sensual enhancement. Like the Arts Naturals Fractionated Oil, Honeydew doesn’t stain clothes. This therapeutic massage oil serves more than being a great massage oil because it also offers several skin-nourishing nutrients, like vitamins A, E, and D. If you’re looking for a hypoallergenic massage oil, then the Honeydew Therapeutic Massage Oil may suit your needs. 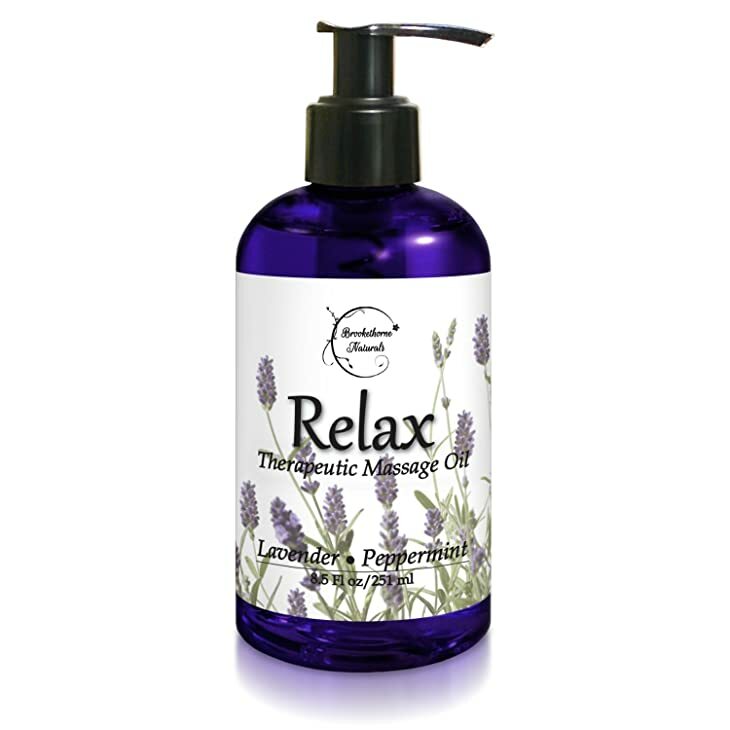 The Brookethorne Naturals Relax Therapeutic Body Massage Oil is made of all natural ingredients, like lavender, peppermint, and marjoram. Peppermint oil helps ease tight muscles and offer relief for painful joins. 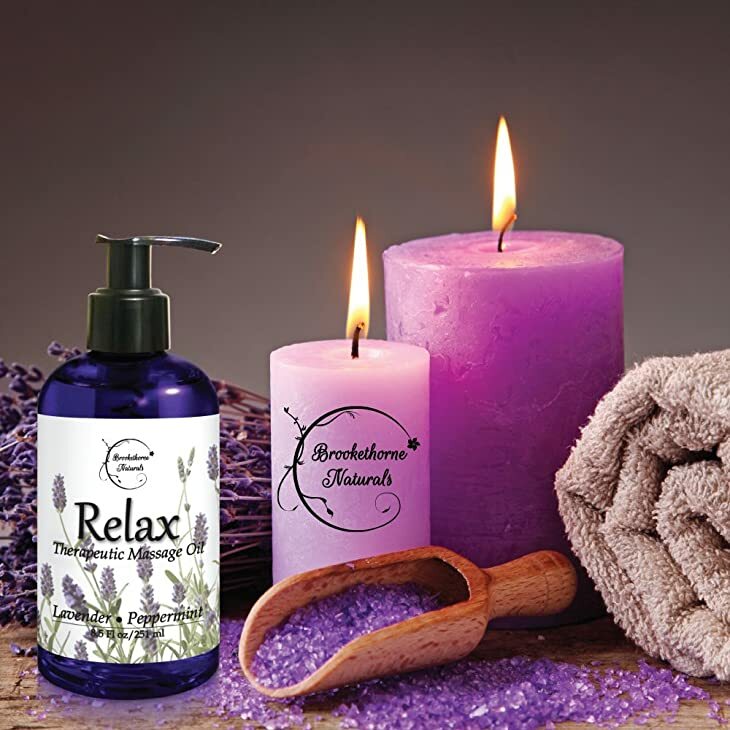 Lavender oil offers calming effects while the marjoram oil offers analgesic properties to muscle pains. This massage oil also contains grapeseed, sweet almond, and jojoba oil. While removing sore and muscle stiffness, this oil also makes your skin smooth. So if you’re looking for a solution for your tired muscles and mind, then the Brookthorne Naturals Massage Oil may suit you best. Among the five best oil for massage brands recommended above, the Brookethorne Naturals Relax Therapeutic is the best oil for massage because it has most of the good features that we’re seeking. Brookthorne Naturals has a sweet smell, medium viscosity, natural plant-based ingredients, and multiple therapeutic benefits. The next best thing is the Honeydew Therapeutic Massage Oil because of its great blend of therapeutic oils. Have you already tried buying an oil for massage? Let us know your thoughts in the comments section below. If you find this guideline and review helpful, feel free to share it by all means.